Paul Buede (left) and Guido Ellsworth started the company in 2011. B.E.S. Technology Inc. specializes in information technology contracting, but it doesn’t want to be known just for that. The Ashburn-based company’s scope is much broader, says President Paul Buede. From 2013 to 2016 the company’s revenue grew 2,709.2 percent, making it the fastest-growing company in the Fantastic 50 for 2018. For example, B.E.S. pays the equivalent of 15 percent of employees’ salaries into their 401(k) accounts even if workers don’t make their own retirement contributions. Employees also get 37 days off a year, including 25 leave days, 10 federal holidays and two personal days. “We put all the days in one bucket so they can use it whenever they need to use it,” Buede says. The company also pays full insurance premiums for employees with either health reimbursement arrangements (HRA) or health savings accounts (HSA) and provides a $5,000-a-year training budget for each worker. “We want to help people increase their skills,” Buede says. Offering generous benefits allows the company to attract people from a small pool of workers who already have high-level security clearances. 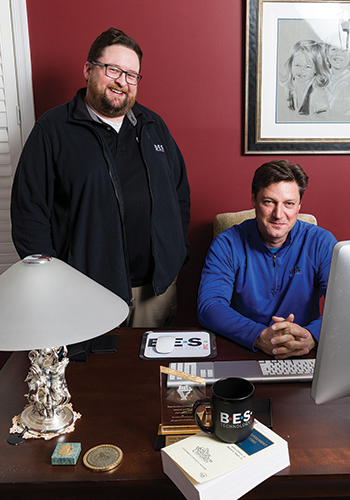 In addition to its benefits, Buede credits B.E.S.’ rapid growth to its small business-focused, family-oriented culture. To help create a pipeline of new talent, the company last year started a summer intern program for college juniors, giving them the chance to work on real-life technical projects. The security-clearance process can take more than a year to complete. “We tend to keep college folks as part-timers until graduation and then put them in internal projects before they get security clearance,” Buede says. Since 2011 the company has grown from the two founders to more than 50 employees. “Most are billable employees that work on customer locations,” primarily in Northern Virginia, he says. During its first years in business, B.E.S. struggled to get major companies to take it on as a subcontractor. It landed its first large contract in March 2014. “We added our first three employees then,” Buede says. The company’s capabilities have grown as its staff increased. “At first we just offered infrastructure services, but as we’ve added people we’ve added services,” he says. Additionally, the company plans to create and sell two software products — a business management platform and a consumer-focused mobile app.